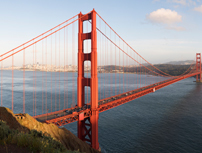 Home of the Golden Gate Bridge, Alcatraz, Bay Lights, Cable Cars, and famous foggy nights, as well as the best sourdough bread, crab, clams and cioppino in the country, no stay in Silicon Valley is complete without a trip to The City. Just 40 minutes from Hotel Parmani in Palo Alto, San Francisco is the 44th most popular tourist destination in the world, and the 6th most visited in the United States. After one visit, you'll see why. The world's largest LED light sculpture, Bay Lights is inspired by the 75th Anniversary of Bay Bridge. At 1.8 miles wide and 500 feet high, the 25,000 bulbs are programmed by artist Leo Villareal to never repeat their mesmerizing display across the bridge's West Span through March 2015. It shines nightly from dusk until 2am. The best way to see the sights of San Francisco is by foot and mass transit. An excellent option to ensure you make it to the most iconic destinations is to buy the CityPASS (Adults $84; Children $59). Each pass is valid for 9 days and provides a Muni and Cable Car 7-day Passport, admission to the California Academy of Sciences, a Blue & Gold Fleet Bay Cruise, as well as admission to either Aquarium of the Bay or Monterey Bay Aquarium, and admission to either Exploratorium or De Young Museum. What public transportation is available from Palo Alto? From Palo Alto Station, you want to take the Caltrain to San Francisco. The ride takes about an hour each way, and a $14 Day Pass will get you to and from The City. Just be sure to review the timetable and plan your ride back to Hotel Parmani accordingly. How should I get around once I'm there? Like every great city, you want to spend as much time on foot as you can. To cover more ground, you can ride Muni, San Francisco's mass transit network of buses, trolleybuses, streetcars, and the famous Cable Cars that have graced the streets since 1873. Other transit options include cabs, tour buses, biking, and BART.